The BMW i8 is an electric car with a three banger gas engine to help out. The first time I saw one it was firmly lashed to the flatbed of a tow truck that slowly made its way down the street. I walked the two blocks down the street thinking that if I lived in New Mexico rather than Florida the object on the flatbed may have been a recovered UFO from Area 7. As it turned out it was a 2015 BMW i8, BMW’s “supercar” hybrid, on its way to a dealer in Miami. Is it Manufactured or Born? The word that best describes the appearance of BMW i8 is “organic.” You can’t imagine it being assembled in a factory. 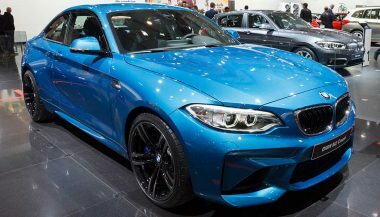 It’s far easier to imagine it being “birthed” at a secret BMW automotive lab. Even the sleek flowing lines of Maserati and Ferrari look crude compared to this hybrid’s profile. 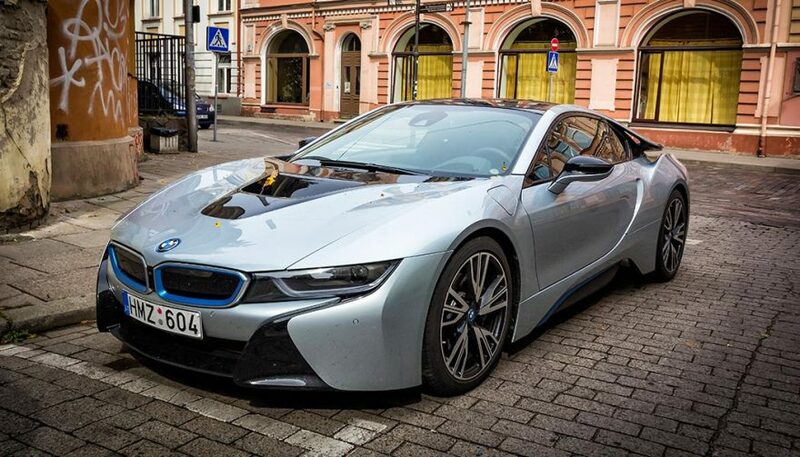 What’s the most distinguishing feature of the i8’s appearance? It’s difficult to say because there are so many. 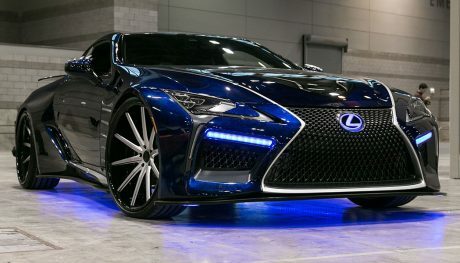 You could point to its floating side panels or shark nosed grill discreetly trimmed in electric blue or the swan doors or just the look and touch of the carbon fiber shell that makes up all the visible exterior surfaces. You could say it slices through the wind but it’s more accurate to say it is one with the wind given its incredible drag coefficient of 0.2. It’s a package that impresses. It’s an attention magnet which can be both a good thing and a bad thing depending if the car behind you has a blue light bar or not. The BMW i8 is a hybrid. It’s an electric car with a three banger gas engine to help out. That setup sounds more like a heavy duty lawnmower rather than an exotic sports car. But when you dig into the specifications the whole “super hybrid” thing comes into focus. The electric motor is powered by a 7.1 kWh lithium ion battery. The electric motor powers the front two wheels through a two stage automatic transmission. The internal combustion engine is a turbocharged 1.5L three cylinder engine that powers the rear wheels via a six speed automatic transmission. Combined the electric motor and gas engine put out XXXhp and an amazing 424 ft.-lbs. of torque. Couple that horsepower and torque with a curb weight of 3455 lbs. and you have one quick machine with a top end of 155 mph and 0 to 60 in 4.2 seconds. 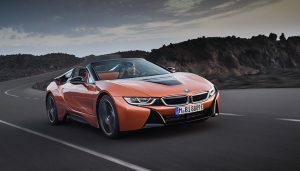 The i8 has four drive modes, all electric E Drive, almost all electric ECO PRO, comfort mode and …sport. If you are a purest you can cruise around the city (up to 15 miles) at 75 mph in all electric. Comfort is the default setting and starts in electric then kicks in the gas engine when you need the acceleration or power to climb a grade. Sport drive engages both the electric motor and the gas engine bringing to bear all the power the car has. It also turns the i8 into an AWD with electric power to the front and turbocharged power to the rear. Marty McFly would really be impressed if he had the opportunity to sit inside a BMW i8 when he went into the future to 2015. The interior of the car is what the cockpit of an F-16 would look like if it was built by Armani. Sleek design, Series 7 leather, an incredible array of technology, the electric blue trim perfectly accenting the space, comfort and ergonomic design (except for the small storage space in the console which opens towards the passenger side). The instrument cluster changes depending on the drive mode. When the electric motor is engaged a red bar chart appears showing how much load you are putting on the battery. Conversely when you slow down or brake the regenerative braking feature kicks in and you see a blue bar showing charging of the battery. The speedometer is digital in all modes. When you are in sport mode the bar chart disappears and is replaced by a tachometer. Thanks to GPS the i8 knows exactly where you are and apparently has programmed every speed limit in the country into its computer. The speed limit on the stretch of road you are on will appear in the instrument cluster and as a heads up display. There are no reports of the car automatically ratting you out to the cops. The infotainment system display is above the dash so there is no looking down to navigate the options. You can manually select settings or use the joystick in the console to select over 140 menu items. The piece de resistance occurs when you push the pedal in Sport Mode. 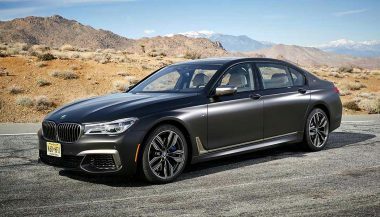 This car looks like a luxury sports car, handles like a luxury sports car but comes up short on sounding like a luxury sports car. That’s pretty much what you would expect when half your power is coming from a battery. 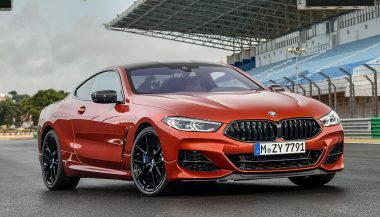 However, the i8 driver is not denied that rich throaty sound of a downshift or hard acceleration thanks to BMW’s Active Sound Design which pumps in appropriately throaty noise. Rumor has it that an exterior sound system will be added in future models to suitably impress pedestrians and others. If you have $140,000, a charging station in your garage and you don’t mind making two trips to the grocery store because of the teeny tiny trunk, you owe it to yourself to check out the BMW i8 as your personal Back to the Future ride.